THERE is nothing like your team winning a football match to ease a troubled mind. Thaksin Shinawatra is a fugitive in exile, his wife is appealing a three-year sentence for tax evasion and he has £800million of assets frozen back in Thailand. Some joked he was probably at the best place at Manchester City to have applied for asylum. After all, madness regularly seems to follow this club. Yet at least for 90 minutes yesterday, Shinawatra could smile — along with the faithful who never desert the boys in blue. 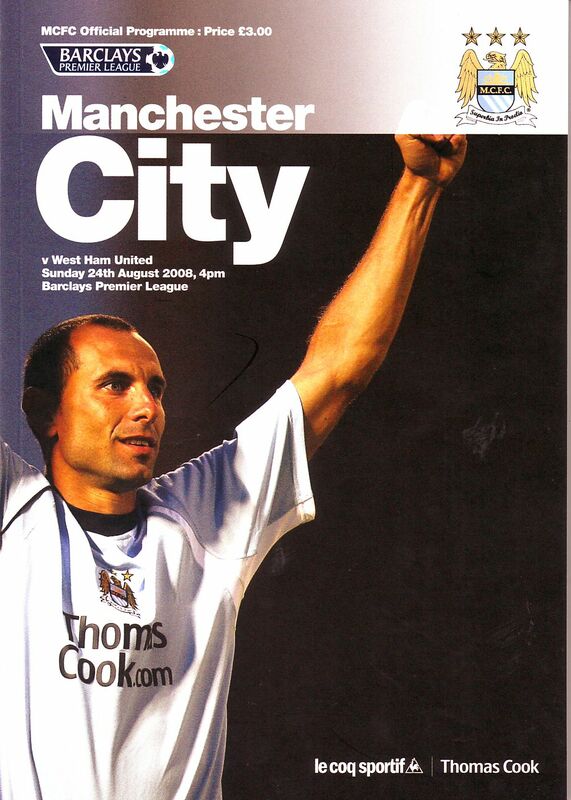 And the man affectionately known as ‘Frank’ could start spreading the news that, for now, City are not beleaguered. The club, in which the ex-Thai Prime Minister has invested some of the millions his former authorities did not manage to grab, recorded their first win of the season. It was a convincing one, too. Good football and good finishing left a good feeling all round, as the gloom was lifted at the City of Manchester Stadium. Three cracking second-half goals in 11 minutes against 10-man West Ham quickly buried the memories of City’s opening-day defeat by Aston Villa. Shinawatra has allowed the club to spend £70m on players since he took over a year ago. Yesterday £8.5m of that, in the form of Brazilian Elano, struck twice. At the other end of the scale, Daniel Sturridge, who City plucked from Coventry when he was just 14, opened the scoring. That was only what City deserved, as they had looked much the better side even before Mark Noble’s 38th-minute sending-off tipped the scales firmly in their favour. 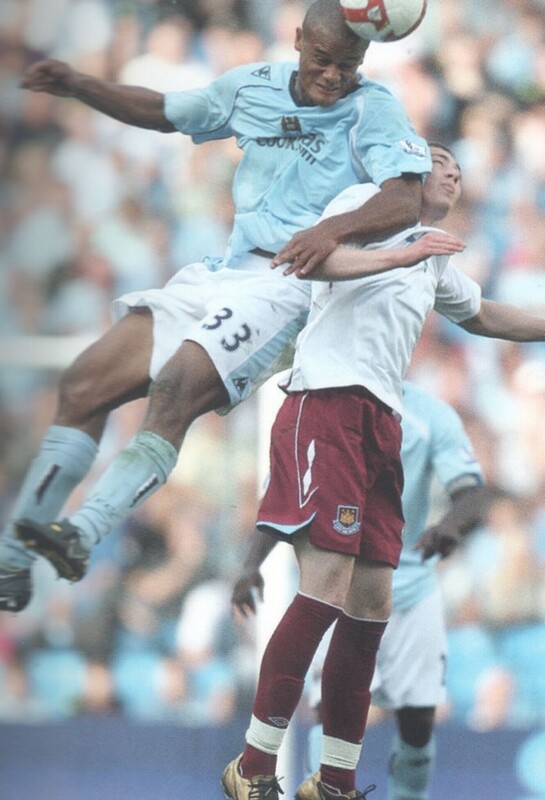 By then, Stephen Ireland had seen a shot cleared off the line by Calum Davenport, while Tal Ben- Haim saw his follow-up deflected onto the bar by the same player. Martin Petrov then hit a tremendous, 25-yard free-kick which hit the outside of Robert Green’s left post with the Hammers keeper rooted to the spot. Noble’s sending-off was totally deserved for sheer stupidity, after he collected two yellow cards in the space of five minutes. The first came when he lost the ball and decided to haul it back with his hand as he lay on the ground. Moments later, he was desperately late sliding in on a loose ball and took Michael Johnson out at the ankles. The second yellow — and subsequent red card from ref Howard Webb — was inevitable. Despite that, it took until the 65th minute before City finally used their numerical and quality advantage to force open the floodgates. Sub Dietmar Hamann laid the ball into Sturridge, who held off his man and swept it out wide to Petrov. His cross was only half-cleared by Matthew Upson and there was Sturridge, having made ground into the box, to lash a shot over a startled Green and into the roof of the net. A little dance followed in celebration from a player who celebrates his 19th birthday a week today. The second goal followed on 70 minutes, as the ball flowed through Johnson and Vedran Corluka before Ireland pulled it back from the touchline. The ball looked to have gone behind Elano but this bloke has some skill. He brought it back under control with one touch and sent it flying into the bottom corner with another. Six minutes later the scoring was complete. 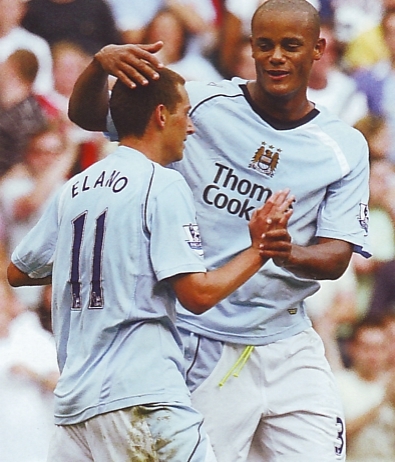 Elano hit his second as boss Mark Hughes waited for the ball to go out so he could sub him. Ireland was again the supplier, having made it to the touchline again before pulling the ball back for Elano to side-foot home. The Brazilian got a huge standing ovation seconds later as he went off. There was plenty more than the goals for Hughes to celebrate, not least the performance of latest signing Vincent Kompany. The Belgian, captured from Hamburg for £6m last week, fitted in straight away. He started in a defensive midfield role, moved to centre-back after Micah Richards’ horror incident and looked equally comfortable in both positions. A further boost for Hughes will come this week, when Brazilian record signing Jo joins up with the squad after playing in the Olympics. The downside for City was the clash of heads with Ben-Haim that left England star Richards out cold for eight minutes. He was placed in a neck brace and eased on to a stretcher before coming round as he was taken to a waiting ambulance. Hammers boss Alan Curbishley will be feeling a bit dazed and confused after this as well. He will want to know why Noble got himself sent off and why his back four went to sleep in the second half. England boss Fabio Capello watched on, but if Hammers striker Dean Ashton has aspirations to get into his next squad he might have to think again as he failed miserably to impress. Ashton missed the last squad due to an injury which turned out to be cramp. Here he might as well have not played for all he achieved. The sending-off left him isolated, yet he did nothing to relieve the pressure on his back four in terms of holding the ball up. And a late free-kick, which flew over, was his only decent effort near goal.